Below is the speech by Prime Minister Voreqe Bainimarama at the launch of the induction of permanent secretaries at Suvavou House yesterday. It has been an extraordinary month last month. Easily one of the most testing in our nation’s history. Four weeks of drama, tragedy and heartbreak. The loss of 44 of our people, many more injured, well in excess of 30,000 homes damaged or destroyed. And a total damage bill stretching into the hundreds of millions. Plus, of course, a baptism of fire for many of you who had just taken up your positions as permanent secretaries, as well as some who had just arrived in Fiji for the first time. Tropical Cyclone Winston has tested our capacity to weather the elements to the very limit. It has tested the resilience of our people to cope with the loss of their loved ones, their homes and possessions. And it has been one of the biggest tests of the Fijian character in the entire history of these islands. Ladies and gentleman, I am proud to say that we have met that test. When nature unleashed its force in a way that no previous generation has ever experienced, we stood shoulder-to-shoulder as one nation, one people. With our experience of previous cyclones, we were better prepared than ever before. And while Winston has been a crippling blow, with God’s help we will emerge from this ordeal stronger and even more united. What lies ahead will test us even further. The task of rebuilding Fiji. Our homes, our schools, our infrastructure and of course our agriculture. Because where we can, we need to rebuild to a much higher standard than we have in the past. Above all, we need to future-proof our country for an era in which these extreme weather events, become more frequent and perhaps even more destructive because of climate change. That means building more sturdy structures, whether it is homes or public buildings. Roofs lashed more firmly to walls. Screws holding those structures together, instead of nails. Our overhead electricity cables placed underground, instead of being brought down by the winds and depriving us of power. The cost of doing all of this will be way beyond our current resources and capacity. And we are going to have to look to the world, for financial assistance. Not only to deal with the impact of Cyclone Winston but the other cyclones that the climate scientists say are definitely coming our way. Ladies and gentlemen, next month, I will be going to New York for the formal ratification of the Paris Agreement on Climate Change. And I will be going with the strongest of messages that what has been agreed, so far is not enough. As well as keeping global temperatures down, we need the industrialised countries to face up to their responsibilities to nations such as Fiji. It isn’t enough for them to reduce the carbon emissions that have produced this crisis in the first place. As we see it, they have a clear moral obligation to use some of their wealth, to help us build our resilience in this terrifying new era that they have helped bring about. They created this crisis, not us as we keep saying. It is we, who are bearing the brunt of their excesses. The industrial revolution that made them affluent. And Fiji intends to do all it can to put the issue of climate resilience building on the global agenda, after the trauma we have suffered from Cyclone Winston. We must start to address this overarching challenge now, even as we make it our priority as a Government to assist our people to get back on their feet. Ladies and gentlemen, this is only the second formal speech I have delivered since the cyclone struck 28 days ago. Because I wanted to go out into the affected areas and engage with our people face to face, to look them in the eye, to shake their hands, to share their stories, share their struggle; to assure them that this Government and the whole nation is with them and that we can. I want to again express our profound thanks to our many friends in the international community for the support they are giving Fiji. The flow of aid continues with the latest arrival of a much-appreciated consignment of relief supplies from China, including tents that are so badly needed to temporarily house our people. Speaking personally, I have never been so proud or so humbled as I am now, to have the privilege of leading our nation at this time. The courage and resilience of our people have inspired me more than ever to serve. And I am telling you this because I want to inspire all of you – our new Permanent Secretaries – to dedicate yourselves to the service of our people. And to a standard worthy of the wonderful ordinary men and women who have done our nation, so proud in this crisis through their bravery, their optimism and determination. I call on you all to serve our people, to the very best of your ability. To do so with honesty, integrity, judgment and compassion. To lead your ministries by example. To set a standard of excellence that really sets the public service alight. To make Government a beacon of trust and an instrument of service. Because now, more than ever, the Fijian people need us to deliver. And it is our solemn duty to do so. To implement government policies that benefit the Fijian people. To deliver and to serve. I am convinced that we now have an A team at the top of our civil service. And that team will spearhead the reform programme, we are currently putting in place with the assistance of the World Bank. To establish a culture of excellence at every level of Government. A culture of efficiency and job satisfaction through hard work. To make the civil service the employer of choice in Fiji. To attract and keep the very best people. Give them attractive salaries and career paths. And above all, to put the notion of service back into the civil service for the benefit of every Fijian. Our vision is to become a modern nation state and capitalise on Fiji’s position, as hub of the Pacific and the pre-eminent island country. To pursue that vision, I believe we have assembled the best team of permanent secretaries in any Fijian government. And we have done so through a transparent process of recruitment using international best practice. You have been chosen solely on the basis of merit, with no regard for religion, ethnicity or socio economic status. You are the best people for these jobs. The best people we could find here in Fiji, and in the rest of the world. Some of you were already in place, others have come from outside. And I especially want to welcome the new permanent secretaries from overseas, who have been chosen for their special skills and the contribution, they can make to capacity building in Fiji. We must never be afraid to learn from the experiences of others. And this Government will never exclude talented foreigners, who can help us take Fiji to the next level. Because the Fijian people deserve the very best. Efficient, effective and economic use of public resources; prompt response to requests and questions from the public, in a manner that is respectful, effective, impartial, fair and equitable. Accountability for administrative conduct; transparency, including timely, accurate disclosure of information to the public. And prompt, complete and candid reporting to Parliament, as required by law. Cultivation of good human resource management and career development practices to maximise human potential. Recruitment and promotion based on objectivity, impartiality and fair competition and ability, education, experience or other characteristics of merit. Permanent Secretaries, those are your constitutional obligations. But I want to leave you with some personal thoughts about what your priorities should be. We have given you the authority to be much more innovative and imaginative than your predecessors, the opportunity to use your skills to run your ministries more efficiently. We have lost too many good people in the past to the private sector. So I ask you to identify talented and exceptional individuals and do everything you can to keep them. We have some wonderful educated young people in Fiji looking for inspiration and to make a difference. So inspire them. Mentor them. Harness their energy and talent. Instill in them a dedication to public service. I made a video the other day for a dinner in Singapore to raise money for cyclone relief. It was edited at the Department of Information by a 21-year old student on attachment from Fiji National University by the name of Marcus Dreketirua. And he did a wonderful job. In fact, it brings tears to the eyes of many people who watch it. That young man is already going places. And it’s our job to help him get there. To mentor Marcus and the next generation of talented Fijians so they can develop their talents for the common good. At the same time, you must be committed enough to identify and remove non-performers and civil servants who resist change, are unwilling to learn new skills and are not service orientated. So ladies and gentlemen, to repeat: I am passionate about all of us, at every level of government, serving the Fijian people with efficiency and with respect. The final thing I want to say is this: we must have zero tolerance for discrimination of any sort. Whether on ethnic, religious, gender, social status or any other grounds, including provincial rivalry. It is unconstitutional and totally unacceptable. Wherever I come across instances of discrimination myself, I am ruthless in pursuing the offenders. And I want that to be a central principle of the entire government. We don’t discriminate. We treat everyone equally, no matter who they are or where they come from in Fiji. We empower every Fijian. We are taking everyone on our journey forward and are determined to leave no-one behind. That is the Fijian way. And anyone who thinks they deserve special treatment or greater privileges than others is wrong. Every Fijian deserves to be treated on their merits, just as you have been when we chose you to lead our civil service. The new Fiji is a meritocracy where even the poorest child deserves the best possible chance of success. Not because of who they know, who their parents are or where they come from but because they are willing to work hard. Take advantage of the free schooling we have provided, make something of themselves and help move Fiji forward. Permanent Secretaries, those are the principles on which we intend to build our nation. And they are the principles on which you should do your jobs. I wish you every success whether you are new or already have a record of government service. And may God bless you all as you assume the roles we have entrusted to you. It is a time of great challenge for our beloved Fiji but equally a time of great opportunity. I don’t think there’s a single Fijian who doubts that Winston has brought us closer together. It has strengthened the fabric of Fijian national life. Strengthened our commitment to care for each other. Our sense of community, of belonging. It has also taught us lessons and helped us identify areas that we can learn from and improve upon. So Ladies and Gentlemen, while the Attorney General and Minister for the Civil Service will be talking in more detail after me, I want to emphasis a fundamental point. 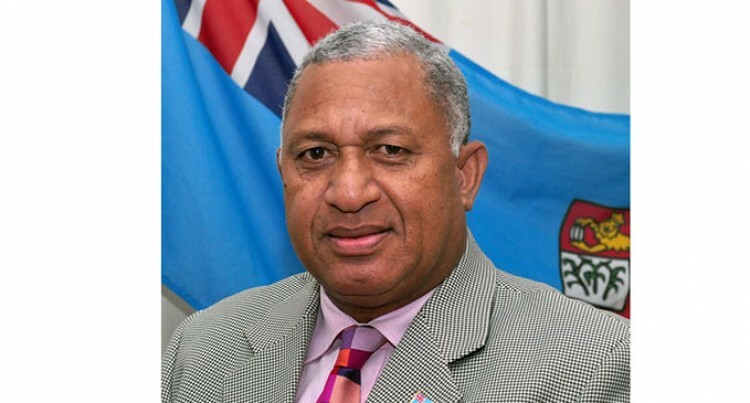 That you, together with the ministers, are at the forefront of helping to build a modern Fiji. A fair, just and prosperous Fiji. As I’m sure the Chair of the PSC and his commissioners will have told you, it is your responsibility to work within your individual ministries to bring about that efficiency and that professionalism. It also your responsibility – all of you – to work as a team. Because all of the permanent secretaries here must be committed to achieving this objective. We cannot return to the old ways in which individual permanent secretaries and ministers were in competition with each other or were territorial. We depend on you to work together and truly be the A team. Because, Ladies and Gentlemen, if we all seize this opportunity, then Fiji will be able to achieve its true potential.